Over the last 50 years Barbie has worn thousands of fabulous frocks and held more than 130 careers, but Barbie is about to take on her most exciting career (and most fabulous outfit) yet. Barbie is running for President! Running as a member of the “B” party, this will actually be Barbie’s fifth run for President, but this time Barbie has something extra special in her little pink bag of tricks. For the 2012 Presidential Glampaign Barbie will be wardrobed and styled by renowned American fashion designer Chris Benz. The new Barbie I Can Be…President doll will be running as a member of the “B” party. The “B” party is all about encouraging girls to “Be inspired,” “Be informed,” and “Be involved” by introducing girls to careers that are aspirational and often underrepresented by women. One of the most unique things about President Barbie is that she is the first Barbie that can stand on her own two feet. Her ultra chic pink wedges (also designed by Chris Benz) actually stabilize Barbie allowing her to balance on her own, making President Barbie the first Barbie that can literally stand on her own two feet. 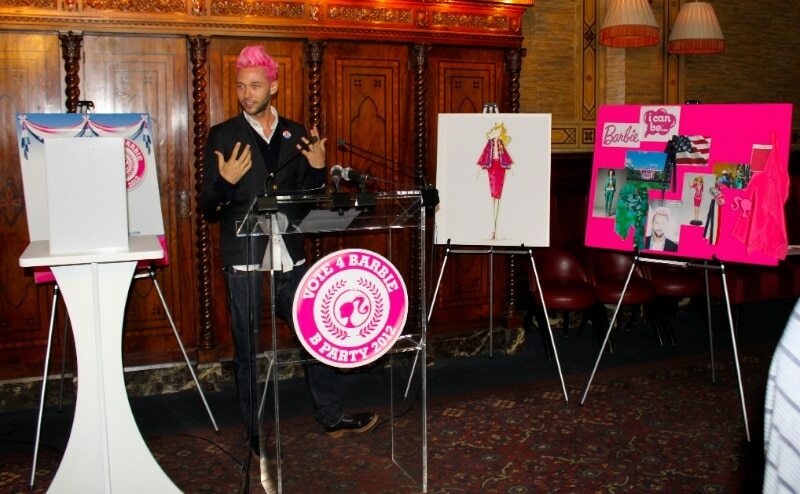 Chris Benz joined Barbie’s Glampaign with an impressive fashion resume. Not only is Chris Benz a Council of Fashion Designers of America (CFDA) award winner, he has also dressed first lady Michelle Obama. 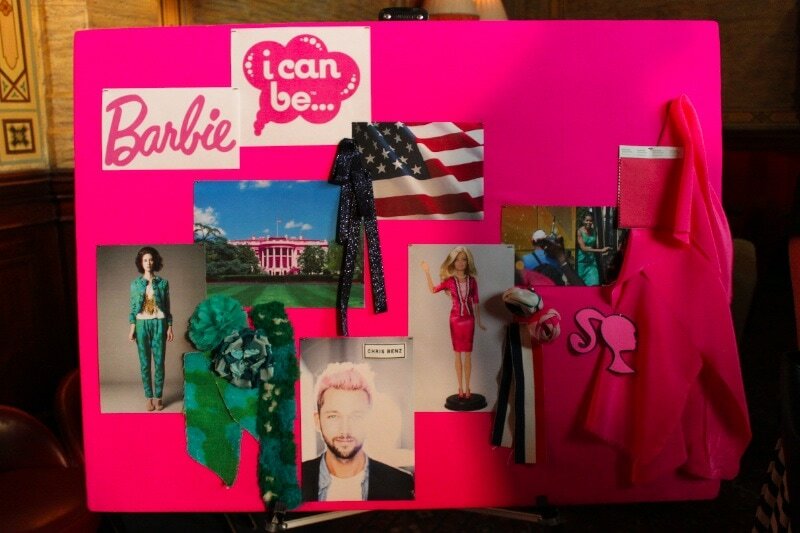 Pictured above is Benz’s mood board that inspired Barbie’s official Glampaign outfit. Barbie wears a tailored pencil skirt suit in Barbie pink with patriotic red, white and blue ruffled trim and she accessorizes her look with a B party campaign button, pearl necklace and earrings and pink wedges. If You Can Dream It, You Can Be It! Presenting the official Barbie I Can Be…President doll! The Barbie I Can Be…President doll will be available June 2012 at retailers nationwide and can be pre-ordered from Mattel here. President Barbie will be available in Caucasian, African American, Asian and Hispanic ethnicities. To keep up with the 2012 Barbie Glampaign you can Follow Barbie on Twitter or read Barbie’s Blog.